Looking for a great opportunity with your team during winter break? Look no further than the Disney President's Day Soccer Festival. Taking place in mid–February, this tournament offers your team great competition at the incredible ESPN Wide World of Sports Complex, where you're treated like a champion and can celebrate like one too in the middle of all the Walt Disney World® Resort magic. *All teams are required to stay in one of the official tournament hotels and use one of Disney's approved travel providers to compete at the event. See details under the Travel Packages and Rules tabs. **Events may be subject to availability, capacity limits, eligibility requirements, and may be subject to delay, change, or cancellation for inclement weather. Application deadline subject to change due to volume of applications and event capacity. In the event that an Age Division Bracket does not attain an adequate number of registered teams, the Tournament Director shall notify those registered teams as soon as possible. The teams will be given the option of playing up or receiving a full refund. All teams are required to stay in one of the official tournament hotels and must make their reservations through one of Disney's approved travel vendors. Please note: Failure to make your reservations through a Disney approved travel vendor can result in the non-acceptance of your team for the designated tournament. All teams, except as noted below, are subject to book lodging through the Disney designated travel provider as a condition to compete at the event. Teams that are located within a 75 mile driving distance of the ESPN's Wide World of Sports Complex are not required to book. Teams that are located within a 90 mile driving distance of the ESPN's Wide World of Sports Complex and have a drive time of less than 90 minutes are not required to book. Addresses used for the determination of the distance/time will be the address of ESPN Wide World of Sports and the team's primary contact address. Google Maps™ or other approved online mapping services will be used to determine driving distance and time. For 2019 Disney President's Day Soccer Festival travel options, explore our special packages. Specially-priced packages for athletes, coaches and spectators include discounted hotel accommodations, theme park tickets and admission to all tournament games. For more information regarding travel-package pricing, please visit Anthony Travel online or call (800) 736-6377. Anthony Travel is the designated travel provider for all US and Puerto Rico teams. Anthony Travel is also your source for specially-priced Walt Disney World® theme park tickets. These tickets, exclusive to participants and families of Disney Soccer tournaments, available through Anthony Travel. *Benefits vary by airline and may not be available in all markets. Discounted car and van rentals are also available. To make your reservations, please visit Anthony Travel online or call (800) 736-6377 for more information. If you are traveling, either domestically or internationally, and would like assistance in securing race entry and travel packages, please contact one of the Official Tour Operators or Travel Agents below to learn more. *If you are unable to locate a travel provider, please contact the Disney Created Soccer Sales Office at 407-938-3805. **Canada travel partners apply for all Non-Showcase Disney Sporting Events. Call 407.WDW.DINE for information on Walt Disney Worldor to make a reservation for your team. To reserve your photographer click here. * To ensure quality photography, only teams and or athletes that register for Disney's Gameday Photos will receive photos service. Gameday Photos does not photograph all games and participants only those who reserve a photographer. By focusing on the athletes that have registered for photography, we are able to capture more and relevant images for a greater, high quality, selection to choose from. Schedules will be released approximately 2 weeks prior to the event. Please follow the below checklist to complete your registration—and prepare to compete! If you do not complete your room reservations by this date your team will not be scheduled and will be cancelled from the tournament. You are required to submit signed Disney Sports Waivers for each team member and coach that will be listed on your official team roster. Please Note: Our waiver collection process has changed from previous years. You are no longer required to mail or fax waivers prior to an event. Please bring signed waivers with you to On-site Tournament Registration. MANDATORY: All teams must enter their rosters complete with bench personnel into the tournaments on-line scheduling system no later than 21 days prior to start of event. The minimum required information is Name, Date of Birth, player ID number, Uniform number and gender. Revisions can be made to the roster up the night of team registration. This information will appear on the tournament game reports to be used by the referees for check-in on the field prior to each game. Teams failing to input this information are subject to removal from the event. Note about eligibility/age requirements: The player's playing age is determined by the following USYSA guidelines for 2018/2019. This tournament is sanctioned by FYSA and USSF. In order to participate, all players and coaches are required to have a current USSF/USYSA/FYSA or their Affiliates Player/Coach Pass Card. If you are not a member of any of these organizations please call (800) 4-SOCCER to obtain membership information. In order to participate in this tournament all FYSA teams must be in "Good Standing". Please submit for approval a copy of your official FYSA computer-generated roster. In order to participate in this tournament all USYS and other USSF affiliates must be in "Good Standing" and obtain Permission to Travel** from their State/National Association. Please send bring a copy of your completed Approved/Certified Roster along with your Permission to Travel to the on-site registration. **Permission to Travel is not required from teams registered with US Club Soccer. In order to participate in this tournament all teams from outside the United States must have written permission and verification from US Soccer and their country's Federation indicating authorization to participate in the Disney Youth Tournament. Please send a copy of your completed Approved/Certified Roster, your Permission to Travel and Proof of Insurance to our office at least 30 days prior to the event. International teams (players and coaches) will be required to present passports at registration. Disney Soccer events shall require all teams participating in the tournament to provide medical releases for each player in an appropriate form. Most organizations/clubs/leagues/teams have their own forms. These are acceptable for Disney Soccer events. These authorizations shall be reviewed by Disney Soccer at registration and kept in the possession of a team official. **All ticket sales are non-refundable and non-exchangeable. 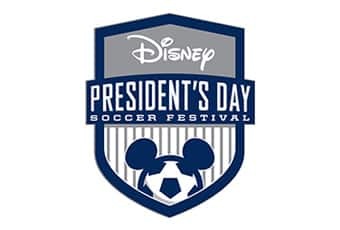 All teams attending Disney President's Day Soccer Festival are required to participate in advance electronic registration by submitting their required documents online to their GotSoccer account. View Advance Online Check-in Information. In order to participate in this tournament all USYS and other USSF affiliates must be in "Good Standing" and obtain Permission to Travel** from their State/National Association. Please bring a copy of your completed Approved/Certified Roster along with your Permission to Travel to the on-site event check-in. All of your participants appearing on the roster (coaches, athletes, staff, etc.) must sign an event waiver. Waivers may be downloaded at the links below, and all waivers must be presented at team check-in when you arrive for the event. Please view the 2019 Tournament rules for details regarding eligibility and the results of the use of an ineligible player or the use of player on multiple teams. To accommodate as many teams as possible, additional Disney approved venues may be utilized. Please note that additional fields may not be on Walt Disney World® Resort property. All teams will have an opportunity to participate at the ESPN Wide World of Sports Complex during the tournament. Registration is now open for International Teams for the Disney President’s Day Soccer Festival, at ESPN Wide World of Sports Complex at Walt Disney World® Resort. All teams must be confirmed and fully paid no later than 30 days prior to take advantage of the Promotional discount package. Travel partners must are responsible for the entire groups registration, documentation and necessary invoices for payment. Specially-priced packages for athletes, coaches and spectators include discounted hotel accommodations, theme park tickets, and admission to all tournament games. Step 1: Contact the Disney Sports international group sales department, Leonardo Leite at Leonardo.Leite@disney.com or call (407) 938-3567, to be qualified into the tournament. Plus, get information on number of rooms and nights needed for the participants. Step 2: After receiving your tournament contract, sign and return by fax at (407) 938-3479 with the payment for the first night of your room block to assure participation. A Disney Sports representative will work with your team contact and travel partner to complete the "on-line" tournament application process. Step 3: Submit paperwork to participate in the tournament: Room list, waiver, medical form and copy of passport, proof of health insurance player cards (online) and representation letter. Step 4: All payments are due 45 days prior to group/team arrival. Payments can be made via wire transfer, credit card or approved company check. Late payments are subject to extra fees. All international teams must be fully registered before 45 days prior to event. Only teams that have a signed contract with deposit are eligible to receive Visas assistance. Dead line for visas assistance is 60 days prior to arrival. The group or team has 14 days from the date the contract is sent out to return the contract signed with the group deposit payment. Full payment must be received before 30 days prior to arrival. Teams that finalize all payments after 30 days prior to arrival will be subjected to late fees, forfeit of deposit, and other penalties that could include cancellation from the tournament. Need to be sent 45 days prior to arrival using the excel spreadsheet sent by Disney. Thank you for your interest in the Disney President's Day Soccer Festival. Please complete the information requested below and a member of the Disney Soccer team will contact you with the requirements for international team participation and information on ESPN Wide World of Sports approved travel providers in your region. Gracias por su interes en el Disney President's Day Soccer Festival. Favor de completar la informacion requerida abajo, y un miembro del Disney Soccer se communicara con usted con los requerimientos que usted necesitara para participar como grupo internacional. Tambien se le enviara informacion sobre las agencias de viajes approvadas en nuestra region y ESPN Wide World of Sports. Obrigado por seu interesse no torneio Disney President's Day Soccer Festival. Por favor, complete o formulário abaixo e um membro do Disney Soccer team fará contato com voce para informá-lo dos requisitos de participação para equipes internacionais e agentes de viagem autorizados em seu país. Are you a player whose team will not be attending, but would like the opportunity to guest play with one of our participating teams? Players interested in being an eligible guest player can register online. Are you interested in refereeing a world-class event at the ultimate sports destination? Disney Soccer invites you to join our referee team for Disney President's Day Soccer Festival.